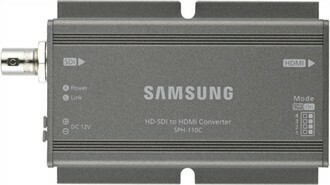 The Samsung SPH-110C is a HD CCTV converter that accepts the HD-SDI signal from the HD CCTV cameras and converts the signal for presentation on the HDMI input of the monitor. The Samsung SPH-110C has many exciting features for users of all types. See the Samsung SPH-110C gallery images above for more product views. The Samsung SPH-110C is sold as a Brand New Unopened Item.